We flew to San Francisco this morning and were bleary eyed and tired when we finally arrived at the hotel. When we wanted to have lunch at around 2.30pm, it turns out many restaurants and cafes are already closed. We had to find something open and in the end the deli across the street solved our hunger pangs with hot pastrami and meatloaf sandwiches. After a two-hour nap to battle jet lag, we headed to Chinatown for dinner. The restaurant is called Great Eastern Restaurant and it looks like your typical Chinese dining establishment. Overall the food was average, not particularly sophisticated with really large portions. We had a lettuce wrap, a dry roast chicken, roast duck with steamed pockets, dried tofu with mustard greens, and fish sliced to pieces that were pan-fried while the bones deep-fried. The highlight was stir-fried crab in a thick sauce that had really fresh meat. The kids at our table weren't that keen in tackling the shellfish, leaving more for us. 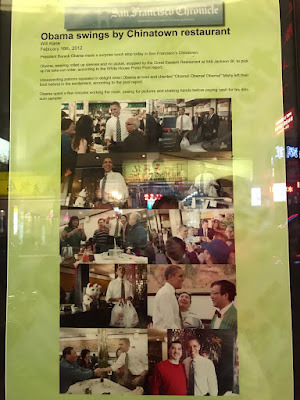 After we emerged from the restaurant we noticed a laminated poster. 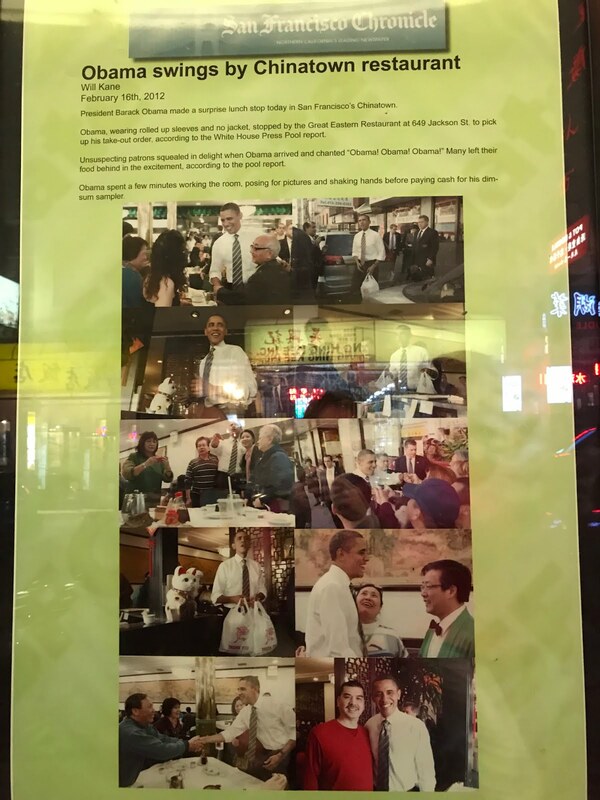 Turns out then US President Barack Obama ate there in 2012 and took pictures with staff, everyone grinning from ear to ear. Another poster had pictures of other celebrities like basketball player Yao Ming and the late astrophysicist Stephen Hawking! So we were in pretty good company!